Gingersnap by Patricia Reilly Giff. 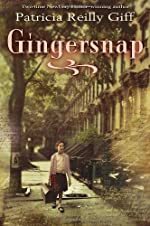 Review: Drama, love, and belief are all words to describe the book, Gingersnap, by Patricia Reilly Giff. Gingersnap is a wonderful historical fiction book to read! When Jayna's brother goes off to war, everything changes. Little does she know that it will be the start of an adventure that will change her life. Jayna is living alone with her older brother Rob who is 9 years older than her. They both are great cooks, but Jayna makes the best soups, and they both dearly treasure a cool stone that has a face-like image on it. Jayna calls it her lucky stone. When Rob leaves for war to be the cook on a destroyer ship for the soldiers, Jayna is forced to live with the neighbor next door whom she hates. But before he leaves, Rob shows Jayna an old recipe book that at one time, belonged to their mother, and their grandmother before that. Inside the front cover is the address of a bakery in Brooklyn where her grandmother supposedly works and lives. Inside the book are many soup recipes, and Jayna treasures the recipe book with her life. When Jayna receives devastating news about Rob, she thinks about traveling to Brooklyn to find her grandmother who, she learns, owns the bakery called Gingersnap, Jayna's nickname. But her grandmother doesn't know that Jayna exists. However, just before Jayna gets the news about Rob, a ghost starts talking to her, and as a result, off she goes with a small suitcase, the recipe book, a turtle she and Rob call Theresa, and the lucky stone, with only the voice to guide her along the way. She's in for multiple surprises along the way! Gingersnap is amazing! It is so heartwarming and sweet; I couldn't put it down. I was able to relate to the characters so well it was almost as if they were real. The author wrote this book quite life-like because I could really feel Jayna's pain and happiness. I felt as if I was there watching Jayna, or even more, that I was Jayna. I recommend Gingersnap for ages 10+ because some of the words and actions may be confusing and hard to understand for younger readers. Either way, you should definitely read Gingersnap! I give this book 5 stars and two thumbs up! We would like to thank Random House for providing a copy of Gingersnap for this review. Have you read Gingersnap? How would you rate it?